RESEARCH TRIANGLE, NC, March 29, 2019 — IEM donated air stairs to the Francisco C. Ada/Saipan International Airport to replace jet bridges that were damaged by Super Typhoon Yutu in Oct. 2018. The two sets of stairs arrived in Saipan on Nov. 12, 2018, and were immediately assembled for use. On Dec. 21, 2018, a small ceremony took place to commemorate the new stairs. 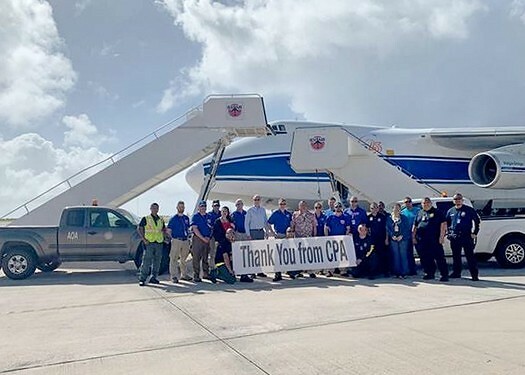 IEM and CPA personnel in front of the donated air stairs at the Francisco C. Ada/Saipan International Airport on Dec. 21, 2018. IEM sent their Air Ops team to Guam and the Northern Mariana Islands of Saipan and Tinian in November of last year to help with the Yutu disaster response. The Air Ops team provided logistical and planning support for the tracking of supplies and relief workers arriving in Saipan and Tinian from destinations such as Guam, Hawaii, and the mainland United States. The team also provided oversight for the acquisition and delivery of the air stairs, assembled them, and provided safety training to airport staff. In December, IEM vice president of international homeland security and emergency management Bryan Koon and IEM Air Ops manager Don Griffith visited the Air Ops team on the ground. During their stay, a ceremony was held at the airport that was attended by Koon, Griffith, representatives of the Commonwealth Ports Authority and the IEM Air Ops team. The larger of the two sets of air stairs reaches wide-body aircraft, including Boeing 747s, Boeing 767s, and Boeing 777s. The smaller set is for narrow-body aircraft such as Boeing 737s and Airbus A321s. The stairs can also be used by Boeing 747 crews to offload cargo without relying on a scissor lift. The additional air stairs allow for a combined total of three commercial passenger aircraft to operate at Saipan International Airport. This press release appeared in Marianas Variety on January 22, 2019.